There is a new game for Gumball. He wants to check the distance he can cover blindfolded. However, he needs your help to jump over the obstacles. Could you help him? 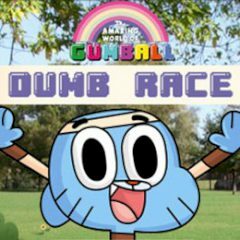 Gumball plays another game he think is funny. He blindfolded his eyes and started to run forward. There are many obstacles ahead, but his jumps over them. He needs your assistance in this game or he won't last for too long. Click on the screen to tell him it's the right time for jump and see how far he can get!